Jordan Shaw (December 2016). Posted in 21stCenturyCulture, 21stCenturyMinistry. As I finish Thanksgiving and head full bore into the Christmas season, John Wesley’s three rules—“Do no harm. Do good. Stay in love with God.”—keep running through my mind. Perhaps this is because we have just come through a contentious election season that has left our communities deeply divided. Or maybe it’s because many of us recently spent hours sitting around food-laden tables with friends and family members who just don’t seem to understand one another. If you are like me, you might be scarred by Uncle Cletus’s homophobic talk and fervent support for politicians you despise. Or maybe Grandma Violet’s snooty judgments and endless campaign to “get you married off” make you extremely uncomfortable. What if, during deeply divided election cycles or uncomfortable family Christmas parties, the mandate to “do no harm” proves utterly impossible? Life sometimes seems too complicated for such simplistic instructions. I’m not ashamed to admit that my wife often accuses me of having a “man crush” on John Wesley. (In reality, it’s just a healthy United Methodist infatuation with the father of the Methodist movement … or so I like to tell myself.) But I do not believe he was correct in his assertion that we must always “do no harm.” That is just not feasible. For example, if I wish to support my friends and family members who are gay men or lesbians, I will challenge Uncle Cletus’s ugly remarks. But when I shut Cletus down, I probably will drive a wedge between us; he may feel pained by my actions. Sadly, I may have to cause Cletus discomfort if I wish to protect my LGBTQ+ brothers and sisters from verbal harassment. Personally, I feel okay with that choice. For if I take Wesley’s mandate seriously, I am called not only to refrain from doing harm myself, but also to prevent others (even beloved Uncle Cletus) from promoting injury. If our holiday celebrations truly are reflections of our communities, post-election, how do we do least harm? This fact was brought home a few weeks ago. On the Wednesday afternoon after Election Day, when I showed up for my weekly office hours at the local coffee shop, a small parade of students filed through the door to talk about their frustration and grief. If some members of the small congregation I serve had heard the conversations, they would have been mortified. In response to students’ experiences and stories of pain, I sometimes said things like, “Trump is what evil looks like with skin on.” At those moments, some of my congregants likely would have stormed out and not returned. Just four days later, I found myself in a very different context. As Sunday worship ended and parishioners filed by to greet me on their way out of the sanctuary, some of them said—as though they were confessing a big sin—“I just couldn’t bring myself to vote for either of them.” And I have a feeling that many of the students I commiserated with on Wednesday would have been hurt by my response: “I know. God is with you in your frustration, holding your hand.” Perhaps some of my young friends would even have been disappointed in me, for I made no mention of evil. On both days, Wednesday and Sunday, I tried to do the least amount of harm possible. In both cases, I probably failed. As someone who navigates the fine line between the sacred and the secular—between the church and the mental health field—I am well-trained to listen for deeper questions. When listening to someone in pain, I try to discern the concerns and questions that lie underneath the surface question that is being asked. Much to my surprise, as I have listened to folks over the past few weeks, I have discovered important connections between Trump supporters, people who are terrified of Trump, and people who just couldn’t bring themselves to vote. Although people in these groups may seem totally different on the surface, they actually have a good deal in common. Let’s start with the fact that all of them have an incredibly deep need to be loved and wanted. The straight man who proudly voted for Trump and the Queer woman who, on the day after the election, shaved her head in grief and put on an oversized grey shirt emblazoned with the word “Mourning” both need to know that God loves them. Both of them lead ordinary lives, pay their bills, go to work, show up at church on Sunday morning, and experience great joy and deep sadness in the foothills of Western Maine. Both want change. Both want to love and feel loved. That said, I’m guessing that neither of them would have fully understood or embraced the conversation I had with the other following the election. While the Queer woman and I brainstormed about how we might hide her if the next administration decides to enact a registry for people in the LGBTQ+ community, the straight man and I discussed his hope that elected officials in Washington, D.C. finally will pay attention to the common person. Even though their specific anxieties were different, both of them were nervous about the future and needed to be reassured of God’s love. It’s sort of like Uncle Cletus, Grandma Violet, and you. If you are like me, when you anticipate Christmas Dinner, you hope against hope that Uncle will keep his homophobic comments to himself, and that Grandma will lay off the judgment before 10 a.m. You dream about a harmonious meal that takes place without rancor. (It is Christmas, after all—and isn’t that how Hallmark has said it should be?) 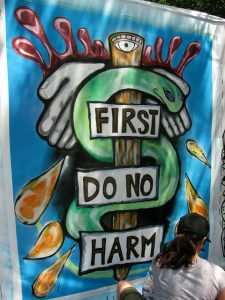 In short, you fantasize that it will be easy to “do no harm,” because everyone will see the world exactly the way you do. But come on. Even as you dream, you know that Uncle Cletus is going to make a horrible comment halfway through dinner, shortly after Grandma Violet embarrasses the chef by announcing to the family that she just doesn’t understand why the turkey is so dry. In such situations, I see no way to “do no harm.” If Uncle Cletus and Grandma Violet are left unchecked, they will hurt people. If they are challenged, they will, at best, begin to argue their points of view and transform the nice, quiet dinner you envisioned into a painful debate that erupts in yelling and even more hurt feelings. The brilliance of John Wesley is this: he never really comes right out and explicitly tells us what to do—except to “do [least] harm.” Only you can decide what that means and how you, yourself, will do least harm. If our holiday celebrations truly are reflections of our communities, post-election, how do we do least harm? The brilliance of John Wesley is this: he never really comes right out and explicitly tells us what to do—except to “do [least] harm.” Only you can decide what that means and how you, yourself, will do least harm. Personally, I have decided that for me, “doing the least harm” involves challenging fear, hatred, and bigotry. So when Uncle Cletus starts talking badly about the LGBTQ+ folks I know and love, I will challenge him. It might cause an argument, but that’s okay. As for Grandma, it might do the least amount of harm to ask her to get involved and help cook the turkey. That way, she won’t have anything to complain about, right? The Rev. 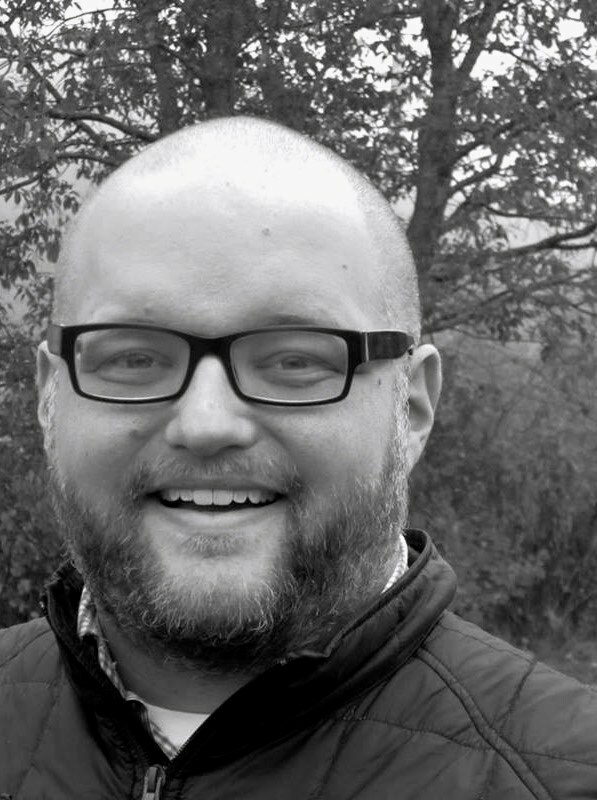 Jordan G. Shaw is currently Pastor of Trinity United Methodist Church in Farmington, Maine, where he lives with his wife, Lucy and the best dog around, Chewie. In addition he is pursuing a Master of Science in Couples and Family Therapy at Plymouth State University. You can connect with him on Facebook. Cover – Howard Chalkley, “Christmas Dinner,” December 17, 2005. Via Flickr. Licensed under Creative Commons CC BY-NC-ND 2.0. Inside – Eden, Janine, and Jim, “First Do No Harm,” June 2, 2013. Via Flickr. Licensed under Creative Commons CC BY 2.0.